If you like using multiple apps on your iPad, Apple has a bunch of multitasking options for you in iOS 10 and iOS 11. Here's what you need to know. Which iPads can take advantage of multitasking? 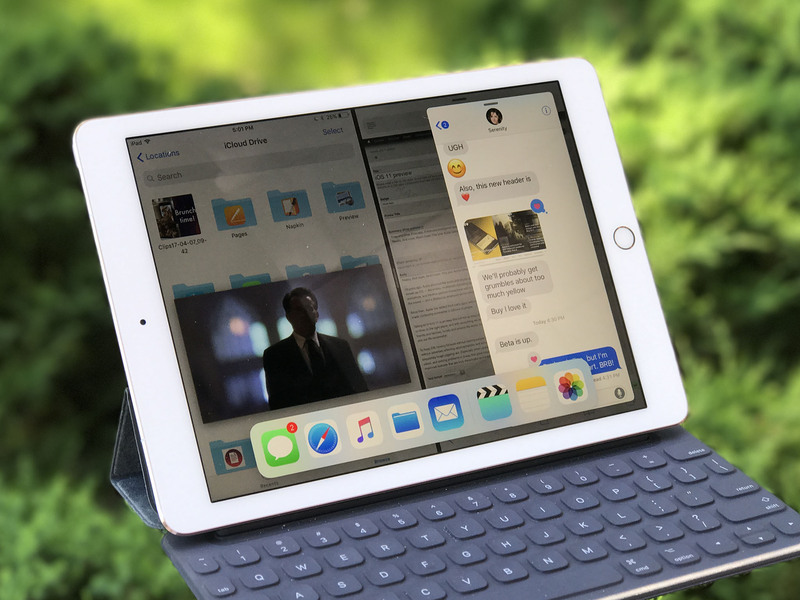 iPad Drag and Drop, Multitasking, and Split View in iOS 11: Everything you need to know! Any iPad that supports iOS 10 or later can use multitasking, but each offers different levels of support depending on its RAM. The 12.9-inch iPad Pro is Apple's best implementation of multitasking: Both generations have 4GB of RAM and a screen large enough to support Split View apps in their largest configuration. The 10.5-inch iPad Pro also has 4GB of RAM, but the smaller screen limits it to iPhone UI-style sizes in Split View. Slide Over: Supports Slide Over; only the Slide Over pane is useable when on the screen, with the background app or Split View apps greyed out. These devices can't use most of iOS 11's multitasking features due to RAM limitations. Slide Over: Supports Slide Over; only the Slide Over pane is useable when on the screen, with the background app greyed out. With gesture navigation on the iPad, you can use four fingers to pinch and swipe your way through apps and the Home screen. Note: This is an iOS 11-only feature. Swipe up from the bottom of the screen with one finger. Place four fingers on the screen of your iPad. If you have a hardware keyboard, you can use Command-Tab to switch between recently-opened apps, too. The iPad has a few different controls for multitasking that enable or disable certain features. Slide Over is enabled by default on all iPads that support it, but iOS 11 will allow you to disable the feature. Navigate to General > Multitasking > Allow Multiple Apps. Toggle the switch On or Off. Picture in Picture is enabled by default on all iPads that support it, but iOS 11 will allow you to disable the feature. Navigate to General > Multitasking > Persistent Video Overlay. Multitouch gesture navigation is enabled by default on all iPads that support it, but iOS 11 will allow you to disable the feature. Navigate to General > Multitasking > Gestures. The Dock puts a few recently-used apps on display along its right side by default, but iOS 11 will allow you to disable the feature. Navigate to General > Multitasking > Show Recents.